Heading into the second month of 2018 and Xbox has already announced the games that will be added to the Xbox Game Pass in February. A total of eight games are being added, seven for the Xbox One and one backward compatible Xbox 360 game. 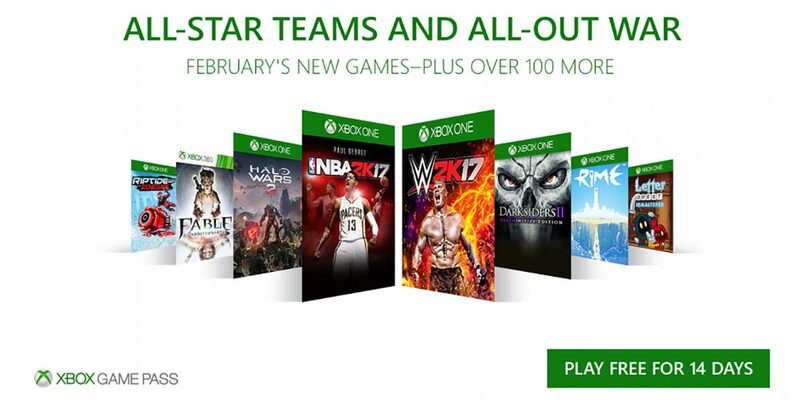 The additions bring the current list of games playable through the monthly subscription service to well over 100 games. As with any title in the program, you can play the full version of these games starting February 1st, as well as save on purchasing the game and/or any applicable DLC. HDR enhanced for richer, more luminous colors. HDR functionality available on Xbox One S with supported games and TVs. It’s the Halo experience you’ve dreamed of – controlling entire armies of Marines, Warthogs, Scorpion tanks, and Spartans on the battlefield from the Commander’s point of view. Halo Wars 2 is a real-time strategy game playable in native 4K Ultra HD graphics with HDR on the Xbox One X and Windows 10. Halo Wars 2 also supports Xbox Play Anywhere: Buy once, play on both Xbox and Windows 10. As the best-selling RPG on the original Xbox, Fable pioneered every player’s choice having a consequence. With Fable Anniversary, a spectacular HD remaster of the original Fable, players will be reminded of why the franchise is so special and unique. All new textures and 3D models, an entirely new lighting system, a slick new interface, achievements, and all of the content from “The Lost Chapters,” make Fable Anniversary the definitive Fable experience for faithful fans and new players alike! While some games may be leaving the service, Xbox hasn’t made mention of any yet so here’s hoping whats currently there is staying just a bit longer as well. What do you think of the games coming to the Xbox Game Pass in February? Let us know in the comments below or on Google+, Twitter, or Facebook.